A young woman from Germany, Sinah Klumper, was in our area going to university for the year, and she started riding Rogo in the fall. She's a former member of the German national pony team and an FEI rider, so she was a great help to Rogo and I (she gave me lessons too). She rode Rogo in our in-house Scotia Series dressage show last October (provincially santcioned series) and scored high 60's in their second level tests, winning their classes. Neither she nor Rogo had done the tests before, but she excels at test riding and Rogo knew all of the movements. That was exciting to see! Sinah returned to Germany in the spring. Rogo and I had a good winter, but in the spring I came off and broke my collar bone (a freak accident and we've put it behind us). Rogo kind of tripped and went down. After consulting the vet and Arthur Kottas it was decided I'd just been letting him get too log and on the fore-hand. I'm very motivated not to do that again! Arthur Kottas was here in early May, about three weeks after my fall. 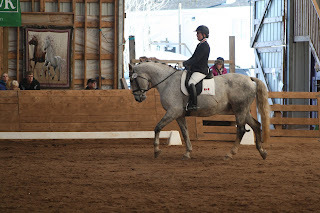 I wasn't sure about riding Rogo and thought we'd do in-hand work, but Arthur lunged him (now THAT was something to see) and declared that Rogo looked the best he'd ever looked and we should continue our training. This clinic will be the main topic of my next post. Joan was all set to continue our lessons after Arthur left, but she hurt her knee and hasn't been able to teach me since. She's hoping to be able to start again this month. I've had the odd lesson here and there with others and also my husband Doug just started helping me too (more on that as well). Beautiful Rogo! Looks like his coloring has changed. Very sorry to hear about your collar bone and happy to read that you were able to catch a few breaks from your daily (heavy) schedule. Please don't stay away so long please. So glad to hear from you! Hope to hear more. Likewise! Now to get caught up on my reading. I hope you're doing well. Thanks! Yes, Rogo is getting so much lighter. His mother was white by his age. So good to hear from you. Likewise! Thank you. It's good to be back.